The books in this column can be purchased through fishpond in New Zealand and Australia. To order from within New Zealand please click on the associated image, for Australian orders there are separate links. Please note: Books that have not yet been published may be available for pre-ordering, sometimes at a reduced introduction price. This is always worth checking out. By buying from fishpond via these links you support the CNO (at no additional cost to you). Thank you! The books in this column are not available through fishpond. Do you need anyting else? 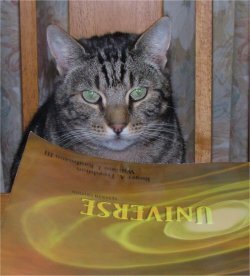 Our chief astronomer cat Tigerheart has some recommendations of his own. The WARRIORS series by Erin Hunter (aimed at young readers from the age of 10 years, but may also of interest to serious cat lovers) tells the story of several clans of wild cats, for whom the stars also have some special significance. To order from within New Zealand please click on the associated image. Check out the specially priced 6-volume box sets! Australians please click here for series 1 and here for series 2. Tigerheart has prepared a list [PDF 17 KB] suggesting the sequence in which to read the books, so that important detail is not revealed before time. Enjoy!